When God gave Abraham his great victory over the King of Elam, he was met on his return by an enigmatic figure, a priest, by the name of Melchizedek. What is of special interest about this encounter is that Abraham gave Melchizedek tithes (a tenth) of all the spoil he had taken from the opposing armies–much of it the property of the Kings of Sodom and Gomorrah (Genesis 14:20). Why did Abraham do that? This incident is interesting, because it seems to establish tithing as an institution prior to the Mosaic covenant. But was tithing in Abraham’s day “institutional” (that is, “a structured pattern of behavior or of relationships that is accepted as a fundamental part of a culture.”) or was it incidental. Maybe even more to the point, was it a law? Abraham and Jacob both pose a problem in this regard, for whether it is a law, a custom, an act of worship, it seems to be at the very least a recognized practice–a meaningful custom. But why did Abraham, and Jacob after him, tithe? Was it merely a custom of the times that they adapted to the worship of God? Was it a law of God that they obeyed throughout their lives? Was it an act of worship? Was it merely incidental, or was it a significant act? Unfortunately, the Genesis account is sparse on this topic–as it is on many things we would like to know. Even so we know more than you might think about this incident and we can draw a number of safe inferences from it. First, was this merely an adaptation of a custom of the times to the worship of God? This question may be irrelevant, because we don’t know where the nations around Abraham derived their customs. Civilization arose in Mesopotamia precisely in the area where Noah and his descendants settled after the flood. How much of what we call “Babylonian” originated with Noah we have no way of knowing. Was, for example, the Babylonian calendar actually the calendar followed by Noah and his sons? If so, then it would be incorrect to refer to the Babylonian calendar as “pagan.” To merely establish that tithing was a custom of the nations around Israel would not necessarily imply that tithing was not of divine origin. They may well have adapted tithing from laws given to Noah. The fact that tithing may have been “voluntary” does not mean that there was no law of tithing. Every offering to God was voluntary even though the offerings were prescribed by law. During the Levitical administration, there is no suggestion in history of any kind of tithe police. There was no Levitical IRS. It seems clear enough in the Genesis account that, for Abraham, paying the tithe to Melchizedek was an act of worship. It was an individual act of worship without coercion. He simply had to decide whether he was going to obey God or not. It is none of my business if another man prays. Why should it be my affair if he tithes? Tithing is voluntary in the sense that it is done as a matter of personal initiative. It is in this sense that we understand the special case of Numbers 31 where a tribute was levied “off the top” of the spoils of war. Here, an amount smaller than a tithe was taken prior to distribution. But if the tithe is an individual and personal act of worship, no tithe would have been required of anyone until after distribution was made. And that would not preclude a larger than tithe amount being given–as seems to have been the case from the warrior class. This passage is sometimes cited to show that no tithe was due from the spoils of war, but that doesn’t follow. If tithing is a matter of personal worship, compelling a tithe makes no sense at all. And remember, Abraham did tithe of the spoils of war. 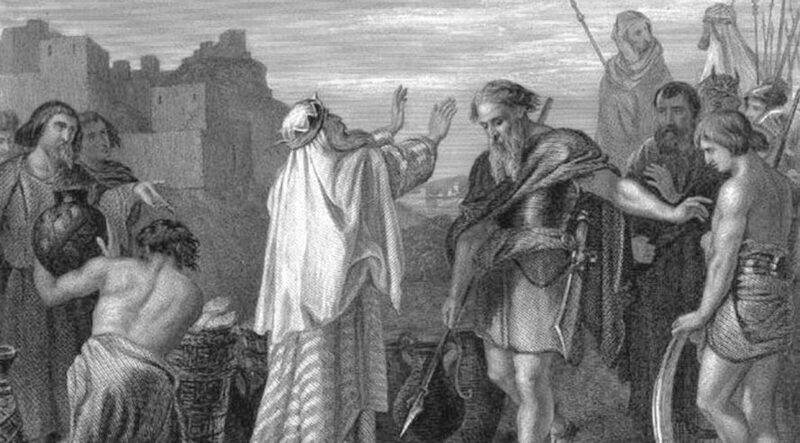 Was Abraham’s tithe incidental, or was it a significant act? It is truly hard, in the face of the subsequent history of tithing to declare it merely incidental. We still have the question of why Abraham did this. Why did he tithe on the spoils? Why not a fifth, an eighth, or better yet, a twelfth? (The decimal system was a later invention, and twelve was a very significant number in Israel’s history). The fact is that Abraham’s tithe cannot be merely incidental, because the New Testament firmly connects it to the Levitical tithe. These tithes are not two entirely different things. They are precisely the same institution in different settings. That being the case, it is hard to argue that tithes are not due on the spoils of war since Abraham, and hence Levi, paid tithes on the spoils of war. The subject of Hebrews 7 is not tithing. It is the ascendency of the priesthood of Jesus Christ over that of Levi, an ascendancy that the author assumes has already taken place (verse 12). Tithing is only an illustration to establish the greatness of the Melchizedek priesthood. But when Hebrews tells us that “the priesthood being changed, there is made of necessity a change also of the law” (verse 12), is it talking about the law of tithing (verse 5) or the law that made men priests? (verse 28). Contextually, one would conclude from verse 13 that it was the law that made Levi priests since Jesus was not a Levite. Even if it is the law of tithing, one would conclude that the change is merely in who is entitled to the tithe, not the abolition of the tithe–something not even hinted at in Hebrews (or anywhere else, for that matter). The Levite did not receive the tithe for nothing. He got it because of the work he was doing. Melchizedek declared that the victory was from God. For Abram not to tithe at this point would have been tantamount to denying that God had given him the victory. What is the best way to acknowledge God as the source of our wealth? A cheapskate would just say thanks, but Abraham tithed. This tells us that there were not only laws known to Abraham, but a structure of laws. Men knew it was wrong to lie, steal, and commit adultery. We know this because of inferences scattered all through Genesis. And so, when we find two men who tithed, we naturally conclude that here is a strong inference that a law of tithing was also known long before Moses came on the scene. It would seem a shame that there is no record in Genesis of that law that Abraham received from God. Students have studied Genesis and have come up with what they call the laws of Noah–all drawn from inferences in Genesis. But in fact we do have a record of the laws that Abraham knew. The reason they are not in the book of Genesis is that they are in the book of Exodus. It is easy to forget that tradition ascribes both Genesis and Exodus to Moses. There are no laws in Genesis because they are in the books following. The primary difference between the law of Moses and the law of Abraham is that the law of Moses was an application of the law of Abraham to a community–a nation. The law of Moses is merely a development of the eternal law of God. Moses, writing Genesis perhaps after the events of Exodus, saw no reason to outline the law in Genesis that he would later outline in Exodus. But he betrays the existence of that law in numerous inferences–even including tithing. The argument that Abraham tithed, not in response to a law, but as a gesture of generosity, is a kind of dispensational theology. Dispensationalism contends that God has different requirements for different people in different eras and times. One version concludes that men in the Mosaic dispensation were saved by the law, but in the Christian dispensation we are saved by grace. Another version says that the Jews lived “under the law” while Christians live “under grace.” God is presumed to have different standards of behavior and different methods of worship for Jew and Gentile, Old covenant Israel and New Covenant Christian and so forth. It is a dispensational argument that the Sabbath was neither commanded nor observed prior to Moses. Dispensationalism seems to say that the law of God is arbitrary. He didn’t have to create a Sabbath law or a tithing law, and having created them, he can just as easily abolish them. On the other hand, if the law of God derives from the nature of man, the nature of God, and the interaction between them, then one might expect adaptations of law to different cultures and even technologies, but the underlying law should remain unchanged. So is tithing dispensational, or is it a recognized and permanent means of doing obeisance to God? The dispensational argument allows a narrow definition of tithing under Moses. Because the law of Moses specifies in one place that the tithe is on agricultural products (Leviticus 27:30 ff), a presumption is made that a tithe was not due on anything else. It is true that nearly all of the illustrations of tithing in the Old Testament are agricultural, but nearly everyone was a farmer. But if one takes a broader view, and asks, “Upon what should I base my tithes?” then the answer includes Abraham’s tithe and Jacob’s vow, “Of all that you give me, I will surely give the tenth to you.” Who gets to decide that? You do. If you don’t believe God gave you this particular bounty, you need not tithe on it. Of course, the tithe is your decision whether it is fruit or vegetables or metal mined from the ground. It is worship, not taxation. It always was, even under Levi. The legalist at this point might be expected to decide that tithing was only to be done on one’s herb garden since Jesus did not mention anything else. The legalist wants to know precisely what is tithable income. Is it only agricultural produce, or must I tithe of a windfall in an investment? This is the form 1040 approach. Abraham’s tithe was not a tax. It was an act of worship. The New Testament says very little about tithing, but it is hard to consider that conclusive of anything. If you take a dispensationalist view, it may be suggestive, but it is only an argument from silence. If it were not for the discussion of the ascendency of Melchizedek over Levi, we might not even have the discussion in Hebrews 7. However, we Christians are the children of Abraham, not Moses (Galatians 3:7), and Jesus said that if we are the children of Abraham, we might be expected to do the works of Abraham (John 8:39) Nevertheless, we may still reasonably ask why our Father Abraham tithed. The choice of words here puts my earlier statements that tithing might be voluntary under a lot of pressure. Because to rob or defraud God suggests that we are taking something that belongs to Him or at the very least is due to Him. And it was not just the farmers who had robbed God, it was the whole nation. There is also a direct connection in this passage between tithing and not tithing on the one hand, and blessings and cursings on the other. The idea seems to be that God owns everything and we are the stewards of His land (Psalm 24:1). And it is not just the land of Israel that belongs to God, it all does (Exodus 9:29). The steward who fails to give the Master his due is likely to be called into account (Matthew 21:33 ff.). And Abraham may well have tithed, not only out of the goodness of his heart, but because he knew the tithe was due to God. Rich toward God? How rich? Well, a tithe is a place to start. 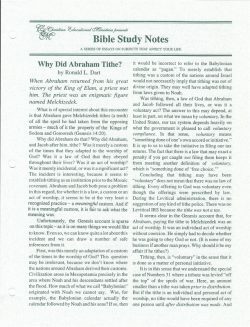 Why Did Abraham Tithe? Free!